*ALL P3Free's are now known as Pic-Fun and are USB updatable. Online retailers may still call it P3Free. Overview : PS Jailbreak/PSGroove clone that takes advantage of PS3 firmware 3.41 exploit and allows you to install homebrew applications. THIS DOES NOT WORK ON FIRMWARE 3.42 OR ABOVE UNTIL A NEW EXPLOIT/METHOD IS FOUND! Quality/Usability : The first batch of P3Free's when it was released were only updatable with serial programmer as the USB bootloader was not loaded. All new and current P3Free's that are USB updatable are now known as Pic-Fun. Pic-Fun's do not require serial programmer for updating. It is ONLY needed if you bricked/need to hardflash bootloader on to Pic-Fun. With Sony going after PS Jailbreak, backordered Teensy's and ATMEL chips all thanks to PSGroove (open source) and clones flooding the scene. P3Free is one of those open source clones that is made by the team behind the solderless Wii-Clip for the Nintendo Wii. Upon receiving the package, the P3Free comes in a anti-static bag and 8-pin FPC cable. Unfortunately, P3Free Team rushed the P3Free just to make it for shipping and did not have a PIC Programmer completed. So those who received the first batch of P3Free (marked with [F]) can not upgrade until the PIC Programmer is completed (more info about situation and solution below). Luckily, the files are preinstalled with "PSGrooPIC1.4_wUSBHIDC18-BTL_LEDG-B4_MCLR_12MHz.hex" so no need to load them yourselves. When the PIC Programmer is finally available, you can update the P3Free with similar file. Simply plug-and-play and is compatible with Original PS3 and PS3 Slim. Unlike some clones, P3Free logo is not printed on the casing but instead labeled with a sticker. Printed on one end of the casing is "FONT SIDE". When I first saw this, I thought typical Chinese misspelling when it was suppose to be spelled "FRONT SIDE". Eventually I found out that its to let you know how to insert the FPC cable. The FPC cable has writing on one side while the other side does not. So the side with writing will be facing up. On the end of the P3Free is a RED LED, GREEN LED, RESET button and slot to insert FPC cable. The case itself feels sturdy and looks well built. Since the files are already loaded, lets get to knowing how to use it. The process is the same as the PSGroove and requires 3.41 firmware. Anything above this will NOT work as Sony has blocked off this method. Anything under 3.41 will cause some problems. You will hear some "beep beep" sound from PS3, then the P3Free's RED LED will start to blink, after a while, the RED LED will turn off and the GREEN LED will turn on. When you see the GREEN LED turn on, it means the P3Free is successfully active, now you can take out the P3Free if you want. Having successfully getting the P3Free to load on the first try, I thought I would try it out by installing some homebrew files such as FTP Server, Snes9x and Backup Manager. To install these applications or any homebrew applications, you will need to download and save the .pkg files to a USB drive such as thumbdrive or harddrive. To install, simply insert USB drive to the PS3 and navigate to "INSTALL PACKAGE FILES" on the XMB under GAME. Select the file you want to install by pressing X and it will automatically install the file. All applications installed and loaded without any problems. when the first batch goods ship out, the bootloader code is not ready yet, so we burn the stable v1.4 code in it, to make it can shipping at first time. now we work with one new code that come with bootloader, and will teach user how to DIY the p3free to come with USB upgrade function. in fact it's very simple, just SOLDER ONE SWITCH to p3free, and use any PIC programmer that come with ICSP port to burn the new code to p3free. maybe is not easy for some new user, but anyway it's one solution still for who want to upgrade their p3free. P3Free Team are giving those from the first batch an option for those not comfortable with soldering a switch. They can ship a new P3Free kit that will be USB upgradeable or get one printer port PIC programmer. So don't worry, you're not stuck with an un-updatable device. We finally received our Serial PIC programmer. If you have the 'F' version or messed up your bootloader then you need to install the USBHID bootloader on your device. I have attached the P3Free bootloader hex file (Bootloader_USBHIDC18_P3Free_V1.0_12MHz_BTL-pin1_MCLRon_LVPoff_F0_Version.rar) which reflects the 'F0' firmware. You need to hardflash this hex file by using a PIC programmer in order to make the P3Free USB updatable. Insert the Serial programmer to Serial Port of your PC and click the "Search" button, to see if it can find programmer or not. If can't auto detect, then means your serial port has a problem. Please check it or change to another PC and try again, until to it can auto detect JDM hardware. Now link to your P3Free kit and click the "Search" button again, it should can auto detect the PIC chip. If not, maybe you insert the FPC cable in a wrong side. When everything is ready, click the "Browse" button to select Bootloader_USBHIDC18_P3Free_V1.0_12MHz_BTL-pin1_MCLRon_LVPoff_F0_Version.hex. It will start to burn and the progress bar will stop to respond, it may seem like it froze but its still programming. After program complete, this green window will show 3 seconds and auto close, now the new firmware is ready for test, all done! Now your PIC programmable P3Free is now officially USB upgradeable. No more need for the Serial PIC programmer. Now you'll need to download P3FREE_Updater_V1.0.rar and the latest iLLNESS P3Free HEX file. 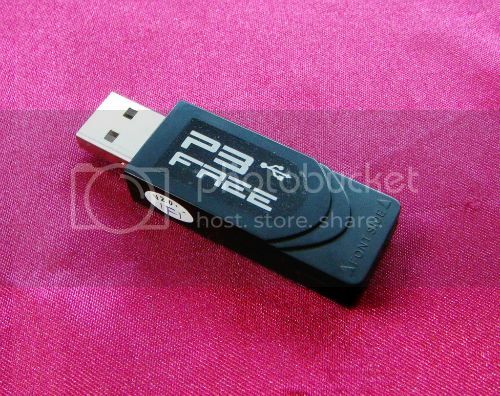 Insert the P3Free into the USB port of your PC and press the RESET button. The app will now detect the P3Free. Click the "Open Hex File", select the right firmware and open it. Now click the "Program/Verify" button and when you see "Verify Started" that means the upgrade complete. Now the P3Free should auto reset and you will see one "Generic USB Hub" device appear in the hardware manager. Conclusion : Overall, the P3Free Pic-Fun Serial Programmer USB worked like it should by taking advantage of the PS3 USB exploit that allows you to install homebrew applications. Unfortunately, those who purchased and received the first batch is left with a non-USB updatable P3Free. The only way to update is by using a PIC Programmer but even this is not available at time of this review. But the USB updatable version is available and will be shipping instead (label will be marked in blue color "F" and red color "1"). If you received the first batch, you can contact P3Free and they'll send you the new USB version as well as the PIC Programmer when its finally available. After being able to finally update to make the P3Free to be USB updatable, the P3Free is now more convenient to use and to update. My Dell PC did not have a serial port, none of my laptops had a serial port either. Luckily, I had an old PC that I still use and that had a serial port and was able to use this to update the P3Free. If you can't find a serial port, you may need to purchase a serial port adapter. Unfortunately, a USB-to-Serial adapter will not work. All new P3Free's are now known as Pic-Fun and are USB upgradeable. You have an option of purchasing the Serial PIC programmer for an additional cost. This would come in handy if you brick your dongle and need to reload the bootloader. Majority if not all other jailbreak dongles dont allow you to. The Serial Programmer is no longer required as all P3Free is now known as Pic-Fun and is USB updatable. Click HERE for a full review on the Pic-Fun.